Arguably the least attention-grabbing film title of all time, Family mitigates that by parading out a host of on-the-rise notable names ranging from Taylor Schilling (Orange is the New Black), Brian Tyree Henry, Saturday Night Live‘s Kate McKinnon in a glorified cameo, and newcomer Bryn Vale crushing her highest profile role to date as the bullied, oddball, socially awkward, but endearing teenager Maddie who is the heart of this somewhat conventional but told with sincerity and no filter story of middle school hell. The next stop for CBS All Access is The Twilight Zone, and before the revival of the classic Rod Serling series begins streaming on Monday, April 1st, CBS All Access unveiled an extended trailer that offers a deeper look into a "dimension like no other." Hosted, narrated, and executive produced by Jordan Peele, the star-studded cast for the first season of the new Twilight Zone includes Adam Scott, John Cho, Allison Tolman, Jacob Tremblay, Rhea Seehorn, Kumail Nanjiani, Steven Yeun, Luke Kirby, Greg Kinnear, Sanaa Lathan, Ike Barinholtz, and Taissa Farmiga. You can watch the extended trailer below before the Monday premieres of the first two episodes: "Nightmare at 30,000 Feet" and "The Comedian" (and go here to watch trailers for those specific episodes). “Everything that happens in this universe has to be the way it is.” The next stop for CBS All Access is The Twilight Zone, and you can now watch the trailer for the first two episodes ahead of series' April 1st premiere. The post ‘The It Crowd’ Star Chris O’Dowd Heading to ‘The Twilight Zone’ appeared first on /Film. Chris O’Dowd has become the latest actor to sign on for a trip to The Twilight Zone, with Get Shorty and The It Crowd star set to appear alongside Amy Landecker (Transparent) in an episode of the anthology series entitled ‘The Blue Scorpion’. The Jordan Peele-hosted revival of the classic Rod Serling show is being produced for CBS All Access, with confirmed guest stars including Greg Kinnear (As Good as It Gets), Steven Yeun (The Walking Dead), John Cho (Searching), Allison Tolman (Fargo), Jacob Tremblay (The Predator), Kumail Nanjiani (Silicon Valley), Adam Scott (Parks and Recreation), Sanaa Lathan (The Affair), DeWanda Wise (She’s Gotta Have It), Jessica Williams (2 Dope Queens), Taissa Farmiga (The Nun), Ike Barinholtz (The Oath), Percy Hynes-White (The Gifted), Rhea Seehorn (Better Call Saul), Seth Rogen (The Disaster Artist) and Luke Kirby (The Marvelous Mrs. Maisel). Less than two weeks before its debut on CBS All Access, “The Twilight Zone” is still bringing more people into the fifth dimension. Chris O’Dowd will star in an episode titled “The Blue Scorpion,” which also features Amy Landecker. That episode is written by Glen Morgan, who serves as showrunner on the Jordan Peele-led reboot. The anthology series will launch its first two episodes on April 1, with new installments to be released available weekly on Thursdays, beginning April 1. Peele is executive producing and hosting the series, stepping into the role that original series creator and narrator Rod Serling made famous. You can get a taste of what Peele’s narration will sound like here and watch the trailer here. The Film Arcade has released the trailer for “Family,” writer-director Laura Steinel’s comedy starring Taylor Schilling as a workaholic whose unexpected week of niece-sitting naturally ends at the Gathering of the Juggalos. The “Orange Is the New Black” star isn’t the only one immersing herself in the music and culture of Insane Clown Posse, as newcomer Bryn Vale dons black-and-white face paint. Watch the trailer below. Kate Stone (Taylor Schilling) is career-focused, and enjoys her life that way. Her brash attitude keeps relationships at arm’s length, making her an outcast in her own right. When her estranged brother calls asking her to babysit her tween niece Maddie, Kate reluctantly agrees to help. But babysitting overnight unexpectedly turns into a week, and Kate’s life spins into chaos. As Maddie reveals stories of being bullied and of wanting to run away and be a Juggalo, the two form a unique bond. 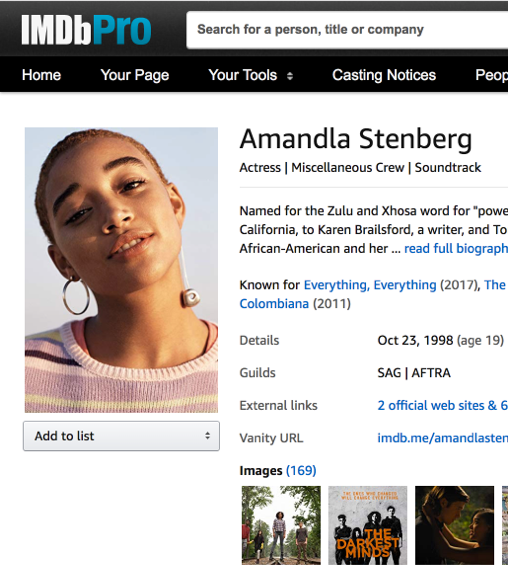 Exclusive: New Amsterdam’s Zabryna Guevara is set as a series regular opposite Allison Tolman and Donald Faison in Emergence, NBC’s mystery drama pilot from Kevin (Probably) Saves the World creators/executive producers Michele Fazekas and Tara Butters, director Paul McGuigan and ABC Studios. Written by Fazekas and Butters and directed by McGuigan, Emergence is a character-driven genre thriller that centers on Jo (Tolman), a police chief who takes in a young child, Piper (Alexa Skye Swinton), she finds near the site of a mysterious accident who has no memory of what has happened. The investigation draws her into a conspiracy larger than she ever imagined, and the child’s identity is at the center of it all. Guevara will play Abby, a pediatrician who is a longtime friend of Jo. Guevara stars as Dora in NBC’s breakout drama series New Amsterdam and in CBS All Access’ Tell Me A Story. The Family trailer is here and it pits Orange Is the New Black actress Taylor Schilling up against some pretty rowdy Juggalos. Though they aren't featured in the trailer, Insane Clown Posse members Shaggy 2 Dope and Violent J have cameos in the movie, which should be exciting for the real-life Juggalos out there. And while it's a bummer that the two iconic rappers aren't in the trailer, it's worth watching to see Schilling take a 3 liter bottle of Faygo to the dome. Even without the Insane Clown Posse references, Family looks like a pretty strong babysitting movie in the vein of Uncle Buck with a hint of Role Models. Donald Faison has joined a strange Emergence at NBC: The Scrubs vet will co-star in the network’s mystery drama pilot from Kevin (Probably) Saves the World creators Michele Fazekas and Tara Butters, our sister site Deadline reports. The thriller centers around a police chief (Fargo‘s Allison Tolman) who takes in a young child (Billions‘ Alexa Skye Swinton) she finds near the site of a mysterious accident who has no memory of what happened. Faison will play the ex-husband of Tolman’s character and the father of their daughter. * Mallory Jansen (Agents of S.